TopLop.com wishes you Happy Easter on 23 of March! 03-23-08 00:00 TopLop.com wishes you Happy Easter on 23 of March! 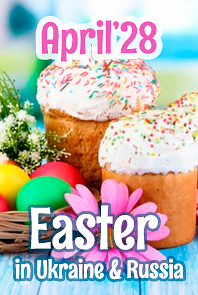 This Sunday (March, 23) all Catholic world celebrates Easter holiday. The USA, Canada, the Great Britain, France, Italy, India, Australia and many other countries celebrate a major religious festival of Catholic Christians. TopLop.com congratulates on this wonderful holiday all our customers and wishes you Happy Easter! It is a time for celebrations, for coming together with friends and family and rejoicing in the glory of Resurrection of Jesus Christ. It’s a season of love and of peace. TopLop.com wishes you all an Easter filled with dear to you traditions and new memories. Let this Easter renews your faith, cheer up your spirit and fills your heart with joy! In countries like Russia, Ukraine and Belarus, Easter Sunday is celebrated on 27 of April. Don’t forget to wish your russian bride, ukrainian woman or belarus girl Happy Easter on this day!